Imagine surfing the web from the palm of your hand. Imagine having the ability to check your email and Hotsync to your home PC while you travel. Until recently, this kind of technology hasn't really been widely available. If you wanted mobile computing, you were pretty much forced to get an expensive laptop. Since I first started using my Visor, the one thing that I've always wanted to do is go online with it. The thought of being able to check out my favorite websites (Systemlogic.net included :)), check my email, and even chat with my friends is music to my ears. There are a few solutions out there to get online with the Visor. These includes wireless modems and your more conventional hard-line modems. Most of the modems for the Visor are bulky and don't really fit too well with the compact design philosophy. The Thinmodem from CardAccess is the first of it's kind to offer a solution that integrated all the features you want in a surprisingly small package. Compared to other modems for the Visor, it's definitely the smallest of the bunch, fitting just right in the Springboard slot. Just when you thought the Thinmodem couldn't get any better, CardAccess releases the Thinmodem Plus. This new product takes the excellent features of the original Thinmodem, upgrades it to a 56kbps modem, and adds 8 MB of user accessible flash memory. All that and the size hasn't changed at all. I am fortunate enough to have received a review unit from CardAccess. I'd just like to thank them because without it this review wouldn't be possible. So, now let's check out what's so special about this new Thinmodem Plus. Dimensions 2.25" x 2.125" x 0.30"
The Thinmodem Plus has a lot of nice features that make it much more than just your average modem. First off you get a fully function 56kps modem. In addition to that you get an extra 7.5 MB of flash memory that you can use for applications and data. It's small size doesn't add any extra size to the Visor. So you don't have to worry about the Visor not fitting in your case with the modem attached. You can even clip on the cover to the back with the modem still in the slot. However, you will still need to remove it in order for the phone cord to fit. The modem doesn't draw much power so you can keep it in your Visor without much drain on the batteries. It also has adaptive power management that keeps the power consumption to a minimum as you surf the web. The included software package allows you to take full advantage of being online without having to go out and get more software. As with any Springboard module, installation is designed to be a snap. You simply plug the Thinmodem Plus into the Visor and all the necessary software is installed for you automatically. The modem didn't come with a CD, so there wasn't any external software to install. The installation process is VERY user friendly. The Thinmodem Plus software pretty much walks you through the entire setup process. Once you start it up you're greeted to a choice of setup options to get you started. From there you can set the various modem and network preferences. More importantly, you can set your dial up and network settings for your ISP. Everything is laid out for you in a neatly organized wizard type interface. Once you've set all that up and get online, you'll have to set up the web browser and email software before you can start using it. The installation guide that comes with the Thinmodem Plus explains how to do all this. To set up Browse-it, you have to create an account with Intellisync at www.intellisync.com. Browse-it uses the user name and password you created, so you have to register if you want to use it. After that, you can dive into the information super highway. Configuring One-Touch is similar to configuring any other email client. You have to specify the protocol being used (POP3 or IMAP4), the name of the incoming and outgoing server, your user name and password, the IP addresses of your primary/secondary DNS servers, and a communication script if it's needed. The instructions will walk you through the process so you don't get confused. That's pretty much it. After configuring everything, you can just go ahead and use the applications. They are pretty much intuitive, but if you're not familiar with them or if they seem confusing, the guide does come with instructions on using the apps. That was the modem side of things. 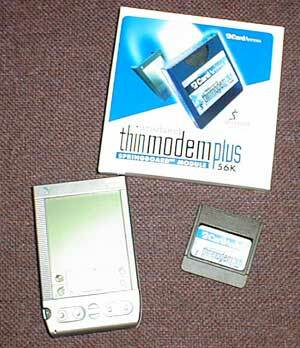 The Thinmodem Plus also serves as a flash memory module. You can move and run programs directly on the flash memory. However, you'll have to be careful because some programs that access databases may not run. The included File Mover application makes managing your programs a breeze. You can organize everything so that you have the programs you need right on the module. For example, you might want to have more games on hand when you travel but you don't use them all the time so they'd just waste space on the internal Visor memory. By placing them in the Thinmodem Plus memory, you will have access to them when you need them the most. The Thinmodem Plus comes with a nice software package to maximize your time online. You don't really need any external software since the essentials are already provided here. However, if you're not satisfied with the included apps, you can go out and install your own favorites. So what do you get? The Thinmodem Plus automatically installs a full featured 16-bit color (for prism owners only) web browser, Browser-it 2.0, and an email client, One-Touch. The Thinmodem Plus also has connection monitoring software that displays information about your modem status information in real-time. Here are some features of Browse-it 2.0 and One-Touch. As you can see, Browse-it 2.0 is a full featured web browser and not just a bare browser bundled with the modem. Browse-it 2.0 is the first 16-bit color web browser for the Palm platform. Since most of the web isn't meant to be viewed on the small screen of the Visor, there will be issues with presentation of web pages. For the most part though, Browse-it does a great job. You can even view web pages off line with their "Snapshot" technology. It's similar to AvantGo channels. The only annoying part is that you have to register a username and password in order to use it. There are a lot of other browsers available out there but at least you don't have to go out looking for a quality one. One-Touch is a decent email client. You pretty much get everything you need in an email client. It has a lot of nice features and the GUI is intuitive and user friendly. In addition to that, the Thinmodem Plus also has File Mover to help manage your files between the Visor internal memory and the Flash memory on the module. The benefits of having a modem for your Visor speak for themselves. You can check email, look at websites, chat, and Hotsync with your home PC all in the palm of your hand. You don't need an expensive laptop anymore because you can get most of the same benefits with the Visor in a smaller package. I mean, if you have one of those stowaway keyboards, your Visor is virtually a laptop. The Thinmodem Plus not only gives you all the benefits of going online, but also serves as a flash memory module to store even more programs. The provided File Mover application is great for managing files between your Visor and the module. You can store rarely used applications in your module memory so they don't fill up your Visor. The price tag of $149.95 is good considering you're getting two modules in one here. The software that's bundled with the Thinmodem Plus is convenient for people that just want to go online as quickly as possible. The installation process is very simple and easy to follow. The small size of the Thinmodem Plus makes it a real winner since it keeps your visor nice and slim. You don't need to use any external batteries since it runs right off the Visor's power. The Thinmodem Plus also has adaptive power management to consume less power than other modems. I can go on and on about all the great stuff this module has to offer, but I think you guys get the point. I really can't think of any bad points to this product. The price tag is a good value but some people might still be somewhat reluctant to pay that much. Well, considering Springboard modules are pretty expensive, at least the useful ones, you'll have to spend this much anyway. The only annoyance is that you have to register with Intellisync to use Browse-it. Also, the phone cord that comes with the Thinmodem Plus is custom made for it. If you lose it for some reason, you'll have to buy one from CardAccess. That's about it for anything bad. 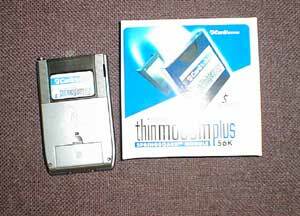 The Thinmodem Plus is an excellent product. It provides everything you need in a modem and flash memory module, and blends the two together into a neat and slim package. The compact size of the module gives it a one up over other modems out there. The installation process is very user friendly for those of us that just want to go online without having to deal with all the BS. For $149.95, you get two modules in one. That value can't be beat, considering a flash module by itself costs around $80, and a modem over $100. With support for modem speeds up to 56Kbps, you have a relatively fast connection. Everything about the Thinmodem Plus impresses me, and I really enjoyed reviewing the product. That's why I gave it a perfect score over-all. It's probably the best modem solution for the Visor out there right now. Thanks again to CardAccess for providing us with a review unit.